I got home from work yesterday and walked into a house that was empty but for two quiet and very confused kitties. I had come up with all sorts of ideas about how to spend my alone time while Mike is away at Tales, but in the end, a very quiet evening was what was in store for me last night. And my husband wasn’t the only one knocking back a cold drink. After my lunch of sushi and soba yesterday, I stopped at BRIX to pick up a bottle of wine, and spotted some 4-packs of Press cucumber soda (which of course I had to try). Their suggested pairing, obviously, was with Hendricks gin, but we were out. Aviation worked just fine, and the combo made for a darned fine tipple on a sticky evening. A few big handfuls of Arcadian Fields’ “Teenage Lettuce Mix,” carrots, celery, cucumber, roasted red peppers, one of our homegrown patio tomatoes, a diced up grilled chicken breast (I had Mike cook a couple for me when he grilled our pork for Sunday’s dinner), and the rest of my buttermilk blue cheese dressing (an adaptation of Grace Parisi’s version, subbing creme fraiche – which we always have on hand – for sour cream), and dinner for one was served. I love the Teenage Lettuce Mix. What a hoot. Looks to me like the Mayor of Singleton won’t be losing out in the meals department while he’s gone but I know you’ll miss him. 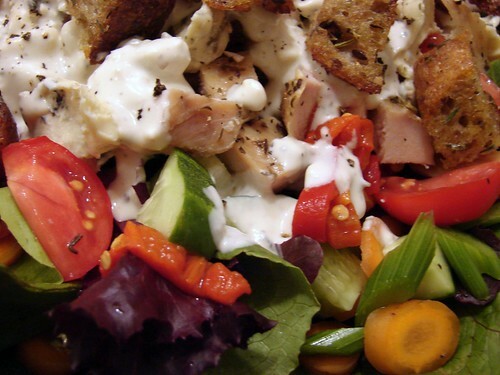 A perfect salad for a quiet evening. I am swirling around ideas right now for using my arugula and spinach with some of the leg of lamb I just grilled. Thank you so much for all the food descriptions in spite of your new schedule. I love hearing about what you cook! My husband took me to this new spot in the neighborhood, and they had a drink called “Gatsby” which was Cucumber juice, cucumber soda, gin, and bitter. I ordered Margherita pizza to go with it, and it was perfect night. Reading your blog is making want to recreate that night at home. Thanks! That soda looks great, I’d love to try it. 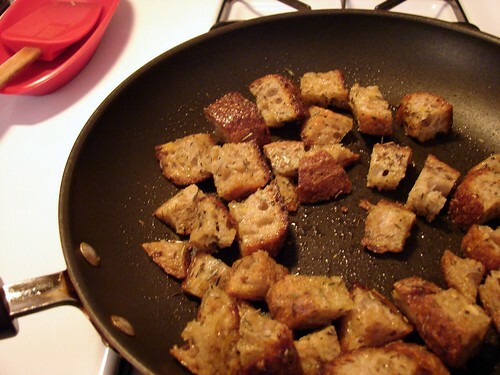 If I made croutons like that I’d probably just eat them and skip the salad!